دراكو – المشرع الأول لأثينا في اليونان القديمة. وضع قانون مكتوب مكان النظام السائد من القانون الشفهي والعداء الدموي ليتم فرضه فقط من قبل المحكمة. أصبح قانون دراكو المكتوب معروفًا بقسوته، مع صفة "دراكوني - شديد القسوة" التي تشير إلى قواعد أو قوانين لا ترحم على نحو مماثل. الدستور الداركوني [الإنجليزية] – أول دستور مكتوب من أثينا. حتى لا يكون هناك من يجهله، تم نشره على ألواح خشبية (νεςονες-axones)، حيث تم الحفاظ به لمدة قرنين تقريبًا، على ألواح تذكارية على شكل ثلاثة أهرامات. جندي هوبليت يوناني وجندي فارسي يتقاتلان، مرسومة علي كايلكس [الإنجليزية] قديمة، من القرن الخامس قبل الميلاد. الحروب الفارسية اليونانية – سلسلة من الصراعات بين الإمبراطورية الأخمينية في بلاد فارس ودول المدن في العالم الهيليني (اليوناني) والتي بدأت في 499 ق.م واستمرت حتى 449 ق.م. فسيفساء الإسكندر [الإنجليزية] تظهر معركة إسوس، من بيت الفون [الإنجليزية]، بومبي. ديمقراطية أثينية – democracy in the أثينا الكلاسيكية developed around the fifth century BC, making Athens one of the first known democracies in the world, comprising the city of Athens and the surrounding territory of Attica. It was a system of direct democracy, in which eligible citizens voted directly on legislation and executive bills. سولون (c. 638 – c. 558 BC)– Athenian statesman, lawmaker, and poet. Legislated against political, economic, and moral decline in اليونان العتيقة. His reforms failed in the short term, yet he is often credited with having laid the foundations for Athenian democracy. كليسثنيس (born around 570 BC). – father of Athenian democracy. He reformed the constitution of ancient Athens and set it on a democratic footing in 508/7 BC. Ephialtes (died 461 BC) – led the democratic revolution against the Athenian aristocracy, which exerted control through the اريوباغوس, the most powerful body in the state. 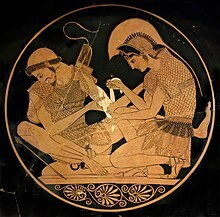 Ephialtes proposed a reduction of the Areopagus' powers, and the إكيلازيا (أثينا القديمة) (the Athenian Assembly) adopted Ephialtes' proposal without opposition. This reform signaled the beginning of a new era of "radical democracy" for which Athens would become famous. بريكليس – arguably the most prominent and influential Greek statesman. 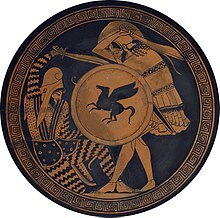 When Ephialtes was assassinated for overthrowing the elitist Council of the Aeropagus, his deputy Pericles stepped in. He was elected إستراتيجوس (one of ten such posts) in 445 BCE, which he held continuously until his death in 429 BCE, always by election of the Athenian Assembly. 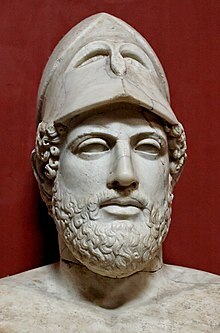 The period during which he led Athens, roughly from 461 to 429 BC, is known as the "Age of Pericles". أوستراكية – procedure under the Athenian democracy in which any citizen could be expelled from the city-state of Athens for ten years. اريوباغوس – council of elders of Athens, similar to the Roman Senate. Like the Senate, its membership was restricted to those who had held high public office, in this case that of أركون. In 594 BC, the Areopagus agreed to hand over its functions to Solon for reform. 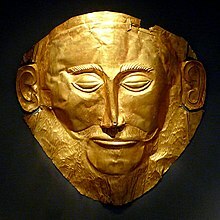 إكيلازيا (أثينا القديمة) – principal assembly of the democracy of ancient Athens during its "Golden Age" (480–404 BCE). It was the popular assembly, open to all male citizens with 2 years of military service. In 594 BC, Solon allowed all Athenian citizens to participate, regardless of class, even the thetes (manual laborers). ^ Stanton, G.R. Athenian Politics c800–500BC: A Sourcebook, Routledge, London (1990), p. 76. ^ Aristotle Politics 1273b 35–1274a 21. ^ Aristotle, Constitution of the Athenians, §3. آخر تعديل لهذه الصفحة كان يوم 23 نوفمبر 2018، الساعة 22:39.